I love wearing false eyelashes for special events but they are so hard to put on! Not even joking Kyle always has to help me and he is kind of a pro at it! Still putting the glue on is messy and either the lash falls off, a corner comes up or you glue your bottom and top lashes together. All in all not a great experience. 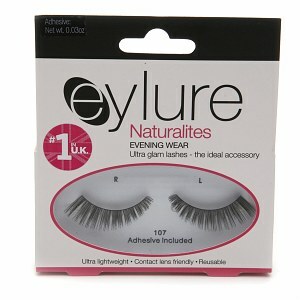 When I went to Ulta this past summer I found eyelashes by EyeLure which were pre-glued eyelash strips in a variety of styles. I bought them hoping they would make the process of putting on false lashes easier and they beyond exceed my expectations! They were so easy to place on, all you had to do was start in the inner corner, line it up right by the lash line and slowly push down until you get to the outer corner, then I held the whole lash down for thirty seconds. They were so easy to put on I could pop both on and get them perfect in under three minutes! The lashed were beautiful and did not at all irritate my eyes. Additionally, these stayed on all day and night! I wore them when I hosted Charlotte NC Fashion Week and at night after using make-up remover and washing my face I literally had to pull them off. They never once came loose throughout the night and were so light they did not bother my eyes like some false lashes do. Also, the package says they are reusable but I did not try this so if any of you ever have please let me know. They ran around $5 at Ulta but to my dismay they do not have them anymore! They have a Katy Perry line by the same company but I want my trusted lash number 116 back which gave me beautiful, long thick lashes that were great for special events.